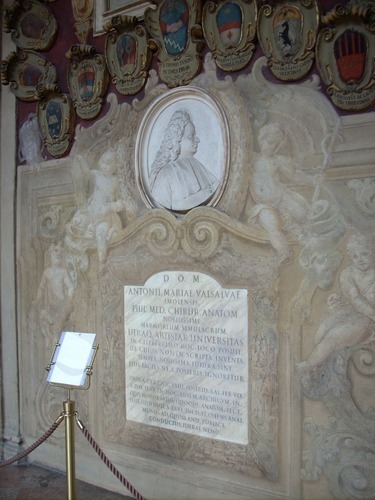 This monument in honour of Antonio Maria Valsalva - a marble medallion and a marble tablet surrounded by a fresco - can be seen in an upper gallery of the Palazzo dell'Archiginnasio (Piazza Galvani 1), Bologna. 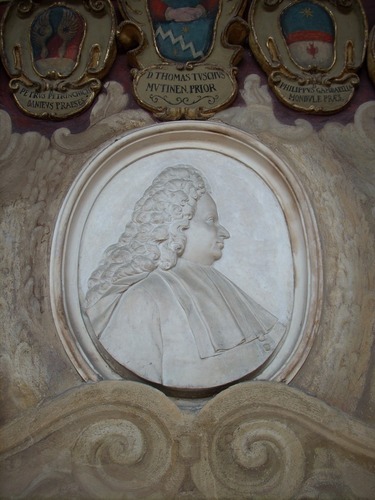 The marble medallion is a work by italian sculptor Angelo Piò, an exponent of the late baroque school. 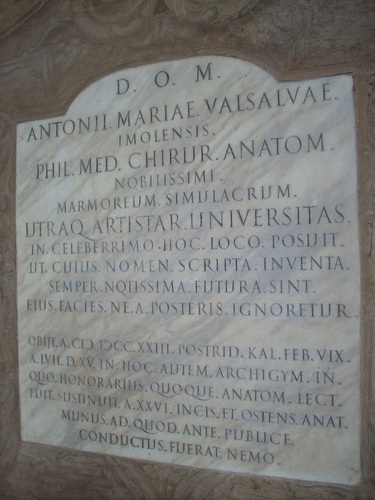 The latin inscription on the marble tablet reads as follows: "D. O. M. / ANTONII. MARIAE. VALSALVAE / IMOLENSIS / PHIL. MED. CHIRUR. ANATOM. / NOBILISSIMI / MARMOREUM SIMULACRUM / UTRAQ. ARTISTAR. UNIVERSITAS / IN CELEBERRIMO HOC LOCO POSUIT / UT CUIUS NOMEN SCRIPTA INVENTA / SEMPER NOTISSIMA FUTURA SINT / EIUS FACIES NE A POSTERIS IGNORETUR. / OBIJT A CIƆ IƆCCXXIII POSTRID KAL FEB VIX / A LVII D XV IN HOC AUTEM ARCHIGYM IN / QUO HONORARIUS QUOQUE ANATOM LECT / FUIT SUSTINUIT A XXVI INCIS ET OSTENS ANAT / MUNUS AD QUOD ANTE PUBLICE / CONDUCTUS FUERAT NEMO".